Rule four is a flip of the biblical commandment: You shall not bear false witness against your neighbor. I like mine better, of course! Here’s why: It’s positive. It says what to do instead of what NOT to do. As humans we always seem to respond better to positives. I’ve spent three days trying to think up wise things about rule four that you don’t already know and can’t come up with anything. Just speak the truth, to yourself, to others. In general the epidemiological data show that only 20 percent of Americans are flourishing. The rest are either languishing or just getting by. Maybe they remember a time in their lives when things were coming together easily; there wasn’t a lot of self-concern, self-scrutiny, or self-loathing because they were focused outward and contributing ot the world. But now they’re just doing the minimum necessary to get by. This “just getting by” mode is not depression or mental illness. It’s merely people living lives of quiet despair. Upwards of 60 percent of the adult population feel like they’re going through the motions. Nobody in positive psychology is advocating full-time, 100 percent happiness. The people who do beest in life don’t have zero negative emotions. In the wake of traumas and difficulties, the people who are most resilient have a complex emotional reaction in which they’re able to hold the negative and the positive side by side. Say you’re in mourning for a spouse, but you’re still able to laugh or feel blessed when you appreciate the deceased’s good qualities, or to appreciate that your neighbors are taking such good care of you. It doesn’t mean that you’re not deeply pained by the death. And the positive emotions you feel are quiet, more reverent. Denying the negative and painting on thpositive is unhealthy, and nobody who makes it their goal never to express a negative emotion quickly drives everyone away from them, because we know their positivity isn’t real. And the reason we know it’s not real is that emotions should reflect our circumstances, and nobody goes through life with 100 percent good circumstances. There’s no escaping loss, grief, trauma and insult. Negativity doesn’t always feel like a choice; it feels like it just lands on you , and you have to deal with it. Positive emotions, I think, are more of a choice. (On ways to increase one’s positivity) One way is to be aware of the present moment, because, again, most moments are positive. We miss many opportunities to experience positive emotions now by thinking too much about the past or worrying about the future, rather than being open to what is. Another way is to pay attention to human kindness – not only what other have done for you, which helps unlock feelings of gratitude, but also what you can do for other people, how you can make somebody’s day. We found that even just paying attention to when you are kind – not necessarily increasing how often you’re kind, but just paying attention to the times when you are – can make you more positive. Another simple technique is going outside in good weather. One of my former students, Matt Keller, who’s not on the faculty at the University of Colorado at Boulder, found that people who spend even just thirty minutes outisde when the weather is good show an improvement in their mood. There are more-involved ways to increase your positive emotions, such as to practice either mindfulness meditation of lovingkindness meditation. You can also rearrange your life around your strengths. Ask yourself: Am I really doing what I do best? Being employed in a job that uses your skills is a great source of enduring positive emotions. The third rule was borrowed from the book No More Mr. Nice Guy. It’s a simple rule that comes in handy for a handful of situations. I’ll tell you about a few of them. 3. Do nothing in secret. I like to use this rule when I have an agenda. Getting the agenda out in the open frees me to be completely in the moment with another person. I’m also a fan of admitting mistakes, even if no one knows about them, by turning myself in. Do this, too, when you’ve broken an agreement, turn yourself in and make a new agreement. Try keeping everything in the open by doing nothing in secret. Speaking my agendas, turning myself in, and owning my mistakes has fundamentally changed my intimate relationships for the better. 2. Listen to your heart, then do what it says. When I operate from a heart space there’s no deliberation, only one clear answer. That one answer is always compassionate, loving and the right answer for the situation. It’s important to remember that this rule has two parts. Knowing what my heart says isn’t enough, I must take action. Without action, it’s just masturbation, just for myself. Give this rule a try the next time a decision looms ahead. Give your brain a vacation. Listen to your heart, do what it says. 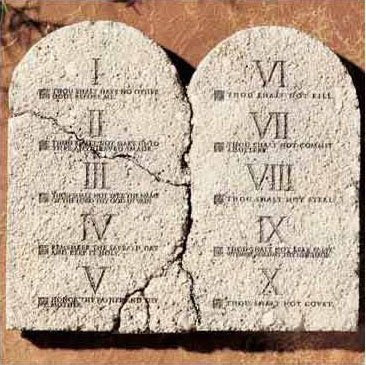 The big beef that I have with the 10 commandments, other than their age, is that they’re nearly all negative. The recurring theme is DON’T DO THAT! I guess it’s a good way to live a life void of creating any of the big evil acts like murder. For me, knowing what NOT to do isn’t enough. I need a yardstick of what to do, how to act and interact with the world. Since I’m a spiritual freelancer, I compiled a list of the rules, commandments if you will, that I live my life by. Am I always successful at this? No, I’m a human. For me, these rules provide guidance and inspiration. It’s one thing to love, it’s completely different to love ruthlessly! To love ruthlessly is to love with complete abandon, getting vulnerable and staying there. It’s loving people on their terms while avoiding thought of what I want it to look like. It’s putting my heart in the driver’s seat and giving my brain the day off. When I love ruthlessly my life gets better, my decisions are from the heart and I’m more compassionate and caring toward everyone, including myself. That’s the first commandment, love ruthlessly. It’s easy and it’s hard, just like everything else. What does ruthless love look like to you?